Just announced: we'll be popping up in SoHo June 23-24! 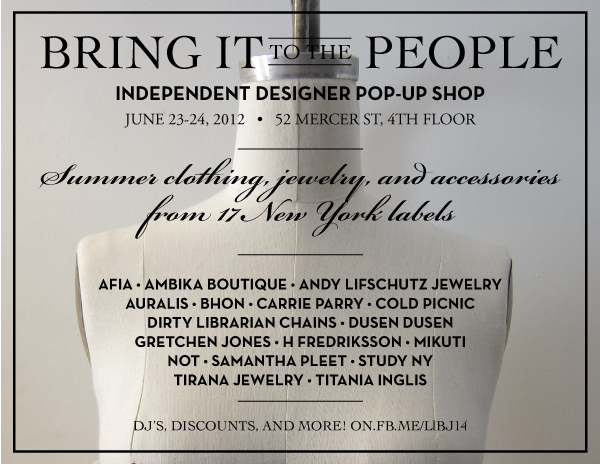 In addition to yours truly, the bevy of 17 clothing, accessory and jewelry lines will include AFIA, Ambika Boutique, Andy Lifschutz Jewelry, Auralis, BHON, Carrie Parry, Cold Picnic, Dirty Librarian Chains, Dusen Dusen, Gretchen Jones, H Fredriksson, Mikuti, NOT, Samantha Pleet, Study NY, and Tirana Jewelry. The shop will be open 11am-7pm on Saturday, June 23, and 12 noon-5pm on Sunday, June 24 at 52 Mercer Street, 4th floor. Past-season clothes will be up to 70% off and summer clothes up to 30% off. Come shop, save, and meet local designers!